Apply mind map in project management, you can do more than you ever thought possible. Edraw mind map gives you everything you need to do everything you want with your project management. Let's take project timeline for example. 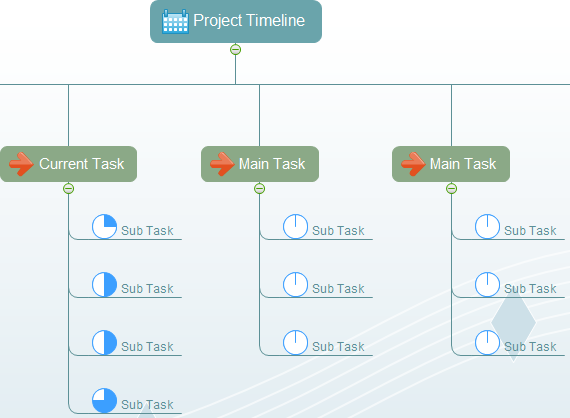 With project timeline as the Main Idea, the tasks of projects are Main Topics. The Sub Topic shapes of mind map can represent sub tasks. The tasks can be divided into main tasks and current tasks. For better management, each task's duration can be shown by filling it in the shape. 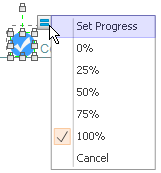 To display each sub task's progress, use the powerful yet simple smart symbols. Drag and drop. And you are done. Click Symbols button on the Library panel docked to the left of the drawing page. Drag Dynamic Progress symbol into the sub task shape. Release the mouse when the sub task shape turns into an orange box. You can enter the completion rate from 0% to 100% using this function. The symbol's blue section represents the completion portion. This means that the sub task hasn't started yet. Choosing this option turns the symbol into white color. This changes a quarter of the symbol into blue color, showing a quarter of the task has been accomplished. If a sub task has completed by a half, click this choice. 75% is finished and 25% of the task is left. 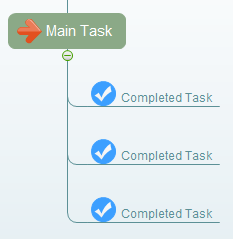 This is used to show completed task, converting the symbol into blue color with a tick in it. If a task is not necessary any more, apply Cancel feature. The symbol will automatically adds a white cross inside to display this status. With this interactive approach, isn't it easy and amazing to manage your project in a visualized way? Regularly review the timeline as you go through the project. You can even add background to it and turn it into entertaining slideshows.